Public schools are supposed to meet the needs of all learners, not just the average learner. This has long been the purpose of public schools and is reflected in the mandate to educate special needs students. We understand that curriculum must be appropriately paced and at the level the student can understand, yet still promote learning by presenting new knowledge and stretching the student’s skills. This is true of any student and many public schools have done a great job of doing this with both the average and special needs learners. The question that should be asked regarding each student is “Is he learning?” This is a much more important question than “Can he pass the material?” or “Will he ace the test?” Education is only equal if each student is learning. Placing a typical third grade student into a sixth grade classroom or a typical six grade student into a third grade class does not result in learning and is unfair to the student whose academic level is asynchronous to the rest of his classmates. While gifted children in a standard classroom often ace the exams, they are not learning at the pace they should be. Children come in all sizes and all abilities. To provide the same education to all students is as fair as providing size medium pads to all the football players. They will fit many players, but the larger kids will be cramped and the smaller kids will be weighed down and the performance of both will suffer. Football players will be most effective with equipment tailored to that player. Learning will be most effective with education tailored to that student. We live an egalitarian society. Egalitarianism, or equality, can take two forms. The first, equality of opportunity, is that all people are equal in fundamental worth and social standing. Skin color, intelligence, or wealth does not give you additional political or civil rights. The second form, equality of results, is the redistribution of assets to compensate for differences in abilities and effectiveness. Each person gets the same. The United States was set up to be egalitarian in opportunity and founded on statements like “All men are created equal.” Unions are often set up to be egalitarian in results, where pay and job retention are not based on abilities and effectiveness, but on the number of years. 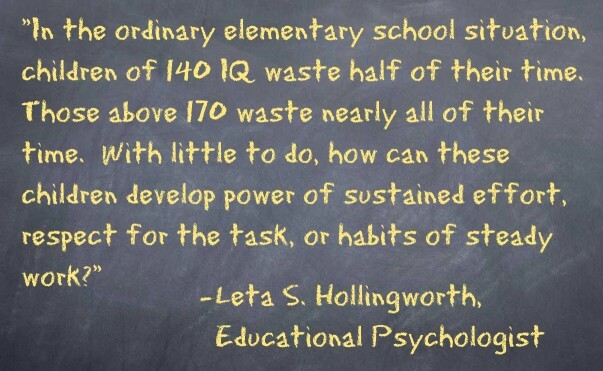 This accounts in part for the bias against gifted education in many public schools. To achieve equality of results, the greatest resources are expended to raise up those struggling, the next greatest to the average learner, and the least to those who are excelling to make sure their academic levels equal their years of schooling. This equality of results is contradictory to equality of opportunity. Each philosophy has its use, its place, and its reason for existence, but the two philosophies are at odds. Despite that, many union members have become great supporters of gifted education. Public schools have become an unusual mix of equality of opportunity and equality of results. Equality of results rules in academics and teacher pay. Equality of opportunity exists in athletics, student politics, and social life. Star athletes are not benched until everyone else catches up. Students do not take turns being class president. Friends are not redistributed from popular kids to outcasts. In contrast, gifted students often do not receive academic stimulation until the rest of the class catches up, are not called on when they know the answer, and are asked to mentor students who are behind. What parents of gifted students desire is a change from equality of results to equality of opportunity. Let our children also struggle to achieve a grade. Let our children also learn new things at a pace appropriate to them. Let our children have a curriculum that fits them. Respect the individual differences in learning for all students. Aristotle wrote ‘There is nothing so unequal as the equal treatment of unequals’. By failing to recognize that people are unequal in aptitudes, we suppress instead of celebrate strengths and we deny instead of correct deficiencies. Equal treatment is to recognize the individuality of each student and provide them the appropriate tools to succeed. Perfectly put! I agree 100%!